I’m really happy to have my friend Bjork Ostrum on the podcast today. While Bjork and I have not met in person, we have mutual friends in Erin Chase and Jim Wang, both of whom I’ve had on the podcast in previous episodes. Bjork runs the very popular site Pinch Of Yum where he blogs about food. And when I say that his site is popular, I mean that it is crazy popular. Last month he had 2.7 million visitors to his site. He has 91,000 Facebook fans, over 227,000 Instagram followers and almost 100K Pinterest followers. Bjork’s motivations for starting his food blog. How long it took for the blog to take off. How does PinchOfYum make money? Steve: You are listening to the My Wife Quit her Job Podcast, the place where I bring on successful bootstrapped business owners and delve deeply into what strategies are working and what strategies are not with their businesses. I’m Steve Chou, and today we’re talking with Bjork Ostrom, who is one of the most successful food bloggers I know. Now Bjork runs pinchofyum.com, and you’ll learn how he makes between 50 and 100K per month running a successful food blogging business. In other news I just want to let you know that tickets for the 2017 Sellers Summit are now on sale at sellerssummit.com. Now what is the Sellers Summit, it is the conference that I hold every year that specifically targets ecommerce entrepreneurs selling physical products online. Unlike other events that focus on inspirational stories and high level BS, mine is a curriculum based conference, where you will leave with practical and actionable strategies specifically for an ecommerce business. And in fact every speaker I invite is deep in the trenches of their ecommerce business, entrepreneurs who are importing large quantities of physical goods, and that’s some high level guys who are overseeing their companies at 50,000 feet. The other thing I can assure you is that is that the Sellers summit will be small and intimate. Last year we cut off ticket sales at around 100 people, so this event will sell out quickly, so once again go check it out at sellerssummit.com. And if you want to know how to start your own online business, be sure to sign up for my free 6 day mini course where I show you how my wife and I managed to make over 100K in profit in our first year of business, so go to my wifequitherjob.com, sign up right there on the front page, and I’ll send you the mini course right away via email. Now onto the show. Steve: Welcome to the My Wife Quit Her Job Podcast. Today I’m really happy to have my friend Bjork Ostrom on the podcast today. Bjork and I have not actually met in person, we both have mutual friends in Erin Chase and Jim Weng, both of whom I have had on the podcast in previous episodes. Bjork runs the popular website pinchofyam.com where he blogs about food, and when I say that his site is popular I mean that it is crazy popular. Last month he had 2.7 million visitors to his site and this incidentally is the slow season for them, he usually gets a lot more traffic. He’s got 91,000 Facebook fans, over 227,000 Instagram followers and almost 100,000 Pinterest followers. What’s cool is that they actually publish monthly income reports and last month Pinch of yam generated roughly 60K. So if you’re interested in how to make money with a food blog, you’ve come to the right place and you’re listening to the right episode. And with that welcome to the show Bjork, how are you doing today man? Bjork: Hey, I’m doing great Steve, thanks so much for having me on the podcast, truly appreciate it. Steve: Yes, so was I accurate about those traffic numbers, usually they are like double that, right? Bjork: Yeah summer is a slow season for food blogs especially if you have any bend towards like nutrition type content, because the pick season will really be January, February where people are wanting to find healthy recipes and things like that. So this is actually perfect that I’m on this podcast because I want to say this right off the bat, my wife Lindsay did indeed quit her job, and she does Pinch of Yam, and I want to make sure like in terms of the content side of things, those traffic numbers and the social media following, like all credit due to Lindsay for building those up. However, I definitely have a role in the business, but I’m more like behind the scenes and Lindsay is very front face things, so I want to make sure that she gets credit for that, and that we can have this super synonymous relationship in terms of the actual content that we are talking about in the name of the podcast, right? Steve: And there my friends is how you stay married for very long. Steve: So give us a quick – I should have been interviewing Lindsay instead, I don’t know? Bjork: No, I think this will be good, I think you’ll be able to get a lot of awesome content from it, but I wanted before we got into it, I wanted to make sure and say that on the content side of things, she drives that forward, I have a really good understanding of it, but I just want to make sure to give credit where credit is due. Steve: I think we have similar roles; you are more in charge of the tech and that sort of thing? Bjork: Yup exactly yup, I love the behind the scenes element of it for Food Blogger Pro, a membership site which we might talk about a little bit later. We’re going through some design updates, so I’m looking at like the check out process on different pages and updating what that looks like or I love the idea of doing like AB tests and things like that. I work a lot with the servers, ad networks; think a lot about like critically about how can we create income from the site itself off of the traffic and engagement that Lindsay has brought to the site. Steve: Yeah we‘re very similar, like my wife is like the brains and I’m like the marketing and the tech and that sort of thing, that’s cool man. We have to compare notes later. Bjork: Yeah, it’s a fun relationship because both are needed, right? So like you can’t just have content without the business side of it and you can’t just have the business side of it without the content side of it. So I feel super blessed and thankful to be married to somebody who is also somebody that is in a sense a business partner, but that is really capable and awesome and super skilled at the content side of things, because that allows me to do what I do. Steve: Absolutely, so give us the quick background story, how did you guys come up with the idea For Pinch of Yam and how did you get started? Bjork: This was six or seven years ago and I was the one interested in online business and technology and computers, and I would geek out on podcasts and audio books and things like that. So I was listening to Gary Vaynerchuk’s book Crush It, and for those that have read it or are familiar you know that he talks a lot about this idea of a personal brand and building a personal brand, and how possible that is because of the internet. The example he gives is if you’re really into worms, like you could be the expert on worm farming and you could write a worm blog, and then there will be people that have worm farms that sell them, they want to come to you and work with you because of your expertise in worms. As I was listening to that audio book just stuff really clicked, and around the same time Lindsay had been interested in recipes and food, and we were recently married, so she for the first time was cooking for two people and really enjoyed that process. We were sharing things on social media and felt like, you know what, I wonder if there is a better place for this to live. Those two things came together at the same time, I was listening to this book; Lindsay was going through this processing of enjoying food and food content, but not really knowing where that would live. So we had this meeting and over the years it’s grown into this mythological meeting that we don’t even know if it actually happened or how it happened, but basically was the sit down conversation of maybe there would be a better place for this. The first step was creating this blog, and we created on Tumblr at the time, and was the place where Lindsay started posting content, and that’s the origin story for us, that’s where things started. Steve: So why did you choose Tumblr? Bjork: At the time that was one of the suggestions that was made, I think Gary Vaynerchuk had built his personal blog on Tumblr, and at the time I don’t think WordPress was quite as established. Well I know it was, and it’s just such a behemoth today. I think it was still established obviously, but it wasn’t until like a year in that we said, you know what, this isn’t the best platform for a food blog, or for really a blog in general with the type of content we were creating. There is just so much that you can do with WordPress as you know, so we made the switch, we switched over, and it’s a WordPress blog now. Steve:	What year was this? Bjork: Started in 2010, April of 2010. Steve: Okay, right. Oh around – I started a year before you I think. Bjork: Sure with the ecommerce site. Steve:	No, with the blog actually not the ecommerce site. Bjork: Okay, ecommerce site was before that, a couple of years before that? Steve: Yeah ecommerce site was 2007, the blog was like 2009. Bjork: I should know this because I just interviewed you for our podcast. Steve: Yeah I know it’s funny, we just spoken. Bjork: I didn’t study my notes before I started. Steve: Were you guys both working at the time? Bjork: Yeah, so Lindsay was a teacher, she’s fourth grade teacher, and I was working at a nonprofit. I would say this would be like a tip or a little jump for people that are listening that are thinking about making that transition, one of the things that I knew at the nonprofit that I was at was there was some flexibility in my role, not a ton but a little bit. I was really interested in web sites and web design and online businesses and I was working at a nonprofit that actually partnered with schools. We would go into schools and we would do retreats. Like those who are familiar it would be like a weekend camp parked into one day, and we would talk about things like respect or courage, kindness, things like that. It really came out of this idea that there was a need for schools to have these conversations, incredible organization called Youth Frontiers. Anyways what happened was I knew I was interested in this business side of things, so what I did is they had a position open for like a 10 hour a week IT person, and I said I would be super interested in filling that because of my interest. So as much as possible if you can, for those that are listening find ways to like own little tiny pieces of a job that you might be interested in an area that you might be interested within the company itself, and maybe that is even volunteering for something. I think that’s a huge way that you can make steps towards moving towards your goal without having to super burn the candle on both hands. There is obviously a little bit of that that has to happen, but as much as you can roll that into the job itself, that can be a huge win and that was one of the ways that I curved my teeth initially with understanding WordPress and web design, and even just like IT stuff in general like what is a server and how does it work. Steve: I see so those skills directly translated over to Pinch of Yam? Bjork: Yeah for sure 100%, and I think it’s not something I went to school for, I didn’t have any experience with it. It was all on the job training in the sense that I said I know I want to do this and I know I want to do it [inaudible 00:10:42] perform on our own, so I’m going to see if there is any way possible that within my normal day to day that I can start training in on this wherever I am. Steve: That’s good advice, so was your wife trained in food or cooking I should say? Bjork: Yup, that’s a good question. Lindsay doesn’t have any formal experience with food or food prep or recipe development or anything like that, just a general interest with it and I think really a skill, this is something that we’re starting to learn, another little takeaway here, but I think that everybody has some type of background that they can shift and maneuver in a way that applies to what they’re doing. For Lindsay, she is an awesome incredible teacher and she is able to take that and she’s a really good communicator as well, and so she is able to take that, adjust that and apply it to this niche where it’s not 100% food, it’s also communicating how to create something or story telling or communicating with a group of people. She’s been able to take that and apply to it, she’s also just from seven, eight years of making recipes, and testing and learning about it, she’s really good with food and recipes and content, but a lot of her skill set also applies to her background of teaching. I think everybody has that previous experience in something that they might not think applies to maybe an ecommerce site or developing an online business, but better if you really critically think about it, you can adjust and maneuver that and apply it in a way where you can leverage what you’re doing more efficiently because of your previous experience in whatever area it is. Steve: Absolutely, arguably the communication and the personality is much more important than the actual thing that you’re talking about, right? Steve: Whether it be food or quitting your job or whatever. I’m curious though, so you started out on Tumblr, how long did it take for the blog to take off, did it off on Tumblr? Bjork: No, well and that’s all relative like when you’re first stating, it feels like it’s taking off when you have 100 visitors. Bjork: It just like scales up appropriately to however much, like as soon as you get 100, the next time you get 100 it’s not as impressive, like you know how that is whether it is page views or the income you’re able to earn from it or whatever it is. Let me pull up a stance real quick here and see, it took a really long time to get to a point where I was like, now we’re moving along fast and have a lot of momentum, it’s one of those things where I would say it’s you work hard for three, four, five years and then you’re an overnight success, right? Steve: Sure, sure, but you know what’s funny is I had Erin Chase who is a mutual friend, and her blog took off in like three months whereas it took me three years, so I was just curious what your trajectory look like. Bjork: Yeah so if I were to look back, and this is on a month to month basis, I would say it “took off” probably at the beginning of 2013, and that’s where we’re starting to get like 500,000 sessions a month pretty consistently. There was also rump time where in terms of as a business we were starting to make comparable income to what we had in our normal jobs, and granted it was like teaching in a nonprofit, so it was not like we were Wall street bankers, but it was at the point where we said, maybe it would make sense for us to switching over to doing it as a full time job. Steve: Did you guys both like your jobs? Bjork: We loved them and that was one of the reasons why we had this like super slow transition out of them, and to paint that picture what it looked like is, and this is maybe a takeaway as well like we didn’t burn the bridge and jump off. We did make this very slow transition, and I know your story is a little bit similar where we would have been able to switch out, but we cut back to like three, four’s time. So we’d spend one or two days fully dedicated to our own businesses, and then it switched to like half time. Lindsay was able to get a job where she had reduced hours, it wasn’t a classroom teacher, she was helping out kind of in a more specialized subject, and then I was going in a couple of days a week. And then it switched, Lindsay left and then I went into like a consulting role where I was doing maybe a few hours per week, and then eventually transitioned full time two years ago. Steve: That sounds exactly like my story, it’s crazy. Bjork: It felt super comfortable and we knew that we had a foot in the door in these other jobs and it allowed us to comfortably make the transition where we could see, hey in general the trajectory with these is up and at any time it’s like you always have a little bit of that feeling of like well everything could crash and burn and it could, but I think with two years of feeling that tension of, yeah I could be leaving my job but I haven’t yet. It really feels good to like draw that tension out, so you just feel really ready and at the point where it makes sense, you’re mature and it’s like the decision is ripe, it’s like ready to be picked and it feels appropriate to move on. Steve: Can we talk about those first three years leading up to the hockey stick so to speak, like what were you guys doing those first three years and what was it like? Steve: Is this just content production? Bjork: It’s content production for Lindsay, so it’s recipes, photography, writing the posts. For me it’s behind the scene stuff, so it would be maybe working with ad networks or thinking about affiliate type stuff that we could be doing for the blog. Eventually it moved into me focusing on Food Blogger Pro. So a for a long time the vast majority of the work those first years in terms of Pinch of Yam itself, the food blog, that was Lindsay, 80%, me 20%. Then once we got to a point where we said, it might make sense to build this membership site for food bloggers, that’s where things really went up for me in terms of my time and my energy, because I shifted and I was focusing really heavily on that to really ramp that up. But those first few years it was just like you just fitted in where you can, and it feels like you’re doing two jobs because you were, right? Bjork: It can be a little bit overwhelming and it can feel like we’re doing so much because you are. I don’t think it always has to be that way, but if you’re doing like slow transition and building up, bootstrapping a business I think it has to be like that for some time where you sacrifice on sleep, or social activities. It doesn’t have to be extreme where you feel completely burned out, but I think there is a little bit of that where you have to pay your dues in order to get to a point where you make that transition and shift and are able to focus on a full time. Steve: How did you increase traffic, was it just putting out content and did people naturally find it, what are some things that you guys did to promote your content? Bjork: In the early stages there were food sharing sites, so FoodGawker, Tastespotting. These are sites where it was kind of served the role what Pinterest does now where you would post your recipes, it would be your photograph, people would like it, they would click on it and they would come to your site. That was really early way of doing it and you need to have really good photography, but that was an important piece of it. Steve: Those guys are still around? Bjork: They are yeah, but in terms of like actual impact that they would have on traffic would be less than maybe focusing on Pinterest or just SEO in general. Bjork: SEO is such a long tail thing like a long term and long tail, so we really start to see that now, that’s one of the primary traffic sources for us is search, but in the early stages it was more of that promoting content. Not in the sense that it was paid, but you were exchanging your photograph on a site, and that allows you to get traffic for them to use that photograph to be able to build these visual representations of recipes. Steve: So back then Pinterest wasn’t around, there was SEO, did you guys do a lot of link building? Bjork: No, that was never something that we were super intentional about doing other than being open to people using the photographs for Pinch of Yam or a list of the ingredients, so relatively we grow in terms of allowing people to use the content on Pinch of Yam. It can’t be the full recipe, but if people said, hey we would love to link back to this recipe and use the photograph; we’d always be open to that. Or there is editors at BuzzFeed and if they’ll reach out we say yeah you have open access to use any of the photographs that we have here on the blog, because we know that that not only is a traffic driver but they are also dropping a link in the BuzzFeed which is a good thing. Steve: Interesting, so early on then I’d say for the first couple of years was the majority of your traffic from these sharing sites? Bjork: Early on it was probably a combination of like social sharing and then starting to get into some SEO stuff, it was a mix of that and then some direct traffic as well. So people that are coming back and maybe they bookmark a recipe and they come back to it. And then when things really started to pick up and become influential was like when it tipped over into Pinterest, and that was a huge traffic driver and still is, it’s the second most popular source of traffic for Pinch of Yam, but for a while was the number one source of traffic. Steve: So in terms of SEO did it take a long time for that to kick in, like did it take years for that to kick in? Bjork: Yeah it took a long time. Obviously right off the bat you’re getting some search terms, but it took a while in order for that to really kick in and become an influential factor in the traffic. I don’t know the exact dates and what they look like, but even like I’m pulling up here and looking at real quick. From December of 2012 we would get maybe 7 to 8,000 visits a day, but it’s like if you go back to that first year even after the first year was maybe like 500, 600, 700, which sounds like a lot especially for people that would bend towards having some type of business related site or ecommerce site, but the reality with like a strictly content based site where to advertise, it’s monetize off of advertisements and sponsorships primarily. That’s not a lot of traffic and engagement just because you need so much in order for that to get to a point where it’s influential. Steve: Okay, so would you characterize your early traffic strategies then was just like putting out really good content and then taking advantage of these social sharing sites? Bjork: Yeah for sure and to be honest I think a huge part of it was not really having a super strong strategy, it’s not like we came in and said we’ve got to think about link building, or we have to think about doing guest posting or anything like that. It was really just Lindsay producing content and trying to figure out the best possible way to get good photographs that represent the recipe, good recipes like finding those. Then there was the intention where I heard of like these food sharing sites, but to be honest like early on we really focused less on traffic and more on content. When I say we I mean that was Lindsay, she was really focusing in on that and there wasn’t really an intentional effort by either of us to say like, hey what are some strategic things we can do for link building or building social media following or anything like that. Steve: So if we would fast forward today and you were to start from scratch today, what would you be focusing your efforts on? Bjork: I think it would be smart to think about within the content that we’re producing and we’re starting to think about this now, like what are the sub niches within it. Pinch of Yam as a food blog is a little bit of lifestyle and then food and recipe which is a very big category, so it could be anything from chocolate chip cookies to like a healthy salad. We have a really broad range of content that we can produce, but that also means like it’s a little bit more of the titanic versus a speed boat. It takes so long to get going and to move when you have a huge range of content that you’re producing. If you have a little niche, you’re able to get traction with that a little bit quicker and also you’d have a better idea of what your offering is as opposed to a site that’s a little bit more of a catch on in terms of the content. I don’t know if I would necessarily niche it down what it is, but within that be intentional about thinking what are the things I want to be known for, what are the niches within the food category that we’re going to really claim and own, and then how can we produce offerings whether that’s the free content or paid for content within those little niches or areas of focus. Steve: I want to take a moment to thank ReferralCandy for being a sponsor of the show. In this day and age, word of mouth is a huge driver of business for most ecommerce stores, and the best way to amplify word of mouth marketing is through a referral program, and this is where ReferralCandy shines. With a just a couple of clicks of the mouse, you could add a referral program to your ecommerce store and reward your customers for telling their friends about your shop. This tactic works wonders, and in fact it is not uncommon to get a ridiculous return on investment, so for example Greats Footwear who is a ReferralCandy customer is currently seeing a 20X ROI. Referral word of mouth marketing is also useful for building up your social media presence as well, because everyone is talking about your company with their friends on Facebook and Twitter. The best part is that ReferralCandy is a set it and forget it service, requires no technical set up, and they are giving My Wife Quit Her Job listeners 50 bucks to try them out if you go to promo.referralcandy.co/steve. Once again it’s promo.referralcandy.com/steve to get a $50 credit to try out the service risk free. Now back to the show. In terms of – you mentioned Pinterest was like your number two. In terms of like Pinterest, Instagram, Facebook, and SEO, how do you allocate your resources today? Bjork: It would be SEO, it would be Pinterest, and then to be honest there is this interesting sub category of social media and I think is something that I’m just starting to understand a little bit better, that we’re starting to understand a little bit better of like it’s not about traffic, it about engagement on those platforms. A great example that I love to refer back to all the time is BuzzFeed. BuzzFeed isn’t trying to drive traffic; they are not trying to post something on social media, like they are not posting a story on Snapchat for instance, and then including a little link back to BuzzFeed to get you to opt in to their free download. What they’re doing is they are entering the room and saying what is the vibe here in this social setting, and then they’re feeding in to that and having conversations with the people in the room. That feels really natural as opposed to like coming in and being like, hey guys, now that I’m here everybody come with me and go in to this other room that has a different feel, and we’ll take you out of the context of where you are. One of the things that we’re trying to do is figure out how can we be having — creating content that lives really naturally on these other platforms and remove the idea of traffic. So we’re not thinking how do we get people back to the site, how do we get people to download stuff for free. It’s more about how do we produce something that fits really well for this platform, that engages people where we can build the following. One of the huge things that we do is then work with companies in a sponsorship relationship, and so they’ll maybe sponsor a video and you’ll see that with BuzzFeed as well, they are a great example of a content driven site that does that at a really high level. Steve: How much traffic do you need to get like a sponsorship? Bjork: I think it depends on the niche, so like last night I was reading Modern Dog magazine which we subscribe to and get, and which is a great case study in and of itself, but as I was looking through it I thought, there is probably not a lot of people that subscribe to this magazine like thousands, maybe not tens of thousands, but they have so many opportunities to do sponsorships or in this case again advertise on the magazine, because they know that it’s such a specific niche. I look at these products that are in there and it’s like, oh yeah I’m interested in not all of them but a lot of them, because we have a dog and we love our dog. And so when I look at these products it’s like I can see how a small magazine with a small subscription base how they can make it even like an actual print magazine which is crazy. The idea being that you can have a really small audience if you have a super specific niche because those people out there sponsors or companies or whatever it is that are interested in working with you will know that and understand that the audience that they are serving that content to is really aligned. An ad in Modern Dog magazine while maybe isn’t as expensive as it would be in Time magazine is potentially just as effective because of the audience that they are advertising to. My official answer is that I think it depends. Steve: In terms of Pinch of Yam, you guys mention it’s advertising and sponsorships, when were you guys able to attract both? Bjork: Sure, advertising you can do right off the bat, and the reason is because the primary way that ads are served right now for a content site, so if you are running traditional banner ads or pre-imposed or video ads, those are programmatic ads, so essentially what’s happening is you’re not working directly with a handshake deal with another company and saying, hey you can show this ad on our site for $3000 this month and then they show them. What’s happening is there is these, it’s essentially micro transactions that are happening on the back end server side where there is an ad buyer and an ad supplier and those are talking to each other, and based on cookie behavior from somebody. People I think understand that in general even if they don’t know advertising, because they go and look at a basket ball hoop and then three days later they see an ad for a basket ball hoop even though they are looking at a coffee site. The reason is because you’ve been cookied and so then that ad shows. The thing to know is that when you’re browsing, what you’re doing is essentially building up a profile, and so they start to understand potentially what your age is, where you’re located, what sites you’ve looked at, what things you’re interested in and that profile is then wrapped into something that ad buyers can say I want to buy $10,000 worth of ads against this type of buyer and they’re making those micro second decisions. Long explanation to say if you want to run ads you can do that relatively early on, you could use something like Google Adsense and get up and running pretty quickly, but the payoff that you’re going to get isn’t very high especially if you don’t have a decent amount of traffic. Steve: What do you guys get paid out? Steve: No I meant CPM sorry. Bjork: At this point overall we’re getting probably like seven to eight, I think it was eight. Bjork: That’s really good, but some of the things to know is that that’s like the cumulative like wrapped up total for like video pre-imposed, it’s the ads that we have injected on mobile and desktop, so it’s not just like one ad, that’s cumulatively like what do we get like on 1000 visits. Steve: I see for all the ads encapsulated? Bjork: So it’s not like one individual ad unit which then adds up so we’re getting like 40 or 50, it’s for 1000 visits on average what will the site earn from advertising. Steve: Okay and then in your experience, which networks have provided the best payout? Bjork: There is a couple of networks and these are specific in the food niche, so the two that I think of that are the most popular right off the bat, they are most common I would say, the company we work with is called AdThrive, and they are going to be a company that comes and both of these are as far as I understand holds your hand and gets you up and running. They have a minimum page views and I don’t know what that would be, you would have to go to their site to check it out and there is another one called Mediavine which operates in the same way. On Food Blogger Pro, those are the two most common that we hear from people using. Then after that I would go into there’s thousands of individual ad companies, but they are usually less of like, hey we’re going to come and partner and more of like we’re going to give you the script that you put on your page and then we collect off of that. Mediavine and AdThrive are a little bit more involved in the process. Steve: Okay and in terms of when you were able to attract these offers, you mentioned like there was like a minimum page view limit, were you guys running Adsense early on and then gradually shifted over? Bjork: Yeah, well it was comparable to ad, so we had Adsense and then we had some food specific sites or companies that we were working with. There was one called Foodie Blogroll, there was another one called Gourmet Ads. These are companies that are ad companies with the focus on food content, but the thing is just with the shift to programmatic over the past few years, you see that becoming more generic in the sense that it’s not like a food related company is going to be working with other food companies as much, because of programmatic. They don’t care as much about who are the blogs they’re working with, they are more focused on who is the actual individual and what is the ad that we’re serving them. So to answer the question, we started out with some individual ad networks like Adsense, Foodie Blogroll, Gourmet Ads, and then eventually you start to work more. So you have a handful so you can an ad stack that you’re running and you’re playing around with which ones work better and which ones show first and things like that. Then eventually we started to slowly shift over towards having a partner advertising company take over and really run with that. Steve: I see, do you still do private placements on your site? Bjork: No, and we never really did. Bjork: No. And to do that is totally possible, but I think it’s becoming less and less common to do actual like display placements, so like somebody would buy something on the side bar because of the shift of programmatic advertising. What is really common and becoming much more important is, it ties into what I was talking about before like the BuzzFeed thing where you partner with and work with a company and they say we want to sponsor this post that you’re doing and this video on Instagram. We will work with a company that does let’s say chocolate, and they want to focus on having their content in a video and then include it in the recipe, so there will be like a product shot of it. It’s like an online version of America’s Got Talent, drinking Dunkin Donuts. Bjork: Whatever it is that they are doing. Steve: Like a TV show is they are embedding like car commercials practically. Bjork: Yes exactly and it’s a more transparent version of that, so it’s not trying to hide it necessarily, it’s more saying, hey for this post, for this video we’re working with this poster company. You’re letting people know and there’s rules and regulations around that, that you have to be transparent in that and we’re pretty intentional at doing that, but the basic idea is the same where you have an audience and you’re exposing that audience to the product in a way that isn’t a traditional ad. Steve: Are there ROI goals on their end for that and how much is that pay compared to your regular CPM ad? Bjork: Yeah, so it’s less CMP based and it’s more – there is a negotiation element to it and there is also just a – I think kind of a – like you scale up with more traffic and engagement obviously. So I wouldn’t be able to say CPM, I think the ROI is a little bit difficult because they are not necessarily tracking sales. Steve: Their branding place basically. Bjork: I think in terms of what you will be able to get for that, for us like at this point we’re looking at anywhere from maybe like — I wouldn’t even know and it depends on the package, but I would have to check with Lindsay because she does more of the client relationship stuff like this. But I would say it won’t be uncommon if you have a site let’s say with a million page views to get somewhere between – this is a total guessing, lots of variables and this would like what type of content is included in social promotion and stuff, but maybe $1,000 to $3,000 for that type of sponsor content. We know people that for instance like they don’t show any ads on their sites, so just super clean site and they don’t have a ton of traffic engagement, but they’re charging $10,000 to work with the brand, to do a video on a post and promote on social media. A lot of it depends on your strategy and how you’re presenting the content on your site, and also negotiation probably. Steve: Okay, you know what I’ve had other food type of bloggers on the podcast, and I have friends that do that too and they’ve all been telling me that just the whole ad revenue model is been decreasing over the years. Are you guys experiencing that as well and what have you been doing to combat that? Bjork: Yeah for sure, and it’s interesting because it decreases and then – I was just thinking about this the other day and then it changes. So like people figure it out and they catch up with it and then the industry changes and then people figure it out, they catch up with it. I think in general, display advertising is on this trend down, it’s becoming less effective, and I would say that in sense of like traditional display ads like banner ads. But it’s interesting because as tracking becomes more effective, then I think the value of that comes up, so we’re starting to see an interesting shift where tracking is becoming a lot more capable, and programmatic is becoming more effective, so I think, I don’t totally understand the deep, deep intricacies of the industry. I think what happens essentially is that as tracking becomes better; people are willing to pay more because it’s more effective to serve those ads to a targeted market. I think that there is an element to that. I think in general it’s a little bit like trying to swim upstream, you can make progress, but it’s not as easy as swimming downstream. The other element of display advertising is – and this a little bit of a shift, but video ads are in such high demand that there is a really high CPM on video ads right now. That’s one of the reasons you see this shift towards videos, not just because that’s how people are consuming content in general. But for content sites whether it be CNN or Mashable or the StarTribune [inaudible 00:40:01] whatever it would be you see them starting to include a lot of video and running ads pre-imposed against that, because it’s such an effective way to monetize content right now. The interesting thing with that is sometimes you’ll even see on some of these new sites that they’re showing videos that have to do with the report but not necessarily. It’s almost like they’re just trying to figure out ways to include video content so they can run an ad against that even if it’s not directly related to the story; maybe it’s remotely related to it. Steve: Does that mean you’re focusing more on video content today? Bjork: Yeah, so we just hired a full time video person, so she is shooting and editing and then we have a part time person that we call a shooting assistant and is handling all of the food side of it. So it’s not necessarily Lindsay every time that’s going to be doing the video, it’s traditional like you see on Facebook a lot of times these food recipe videos where the person isn’t necessarily front center, so we’re doing a lot of those and starting to include those on social media as well as within posts and things like that. We’re really leaning in to it; we’ve hired a full time person and somebody part time. Steve: In terms of Food Blogger Pro, that was my way of trying to segue in to Food Blogger Pro by the way. Bjork: Yeah nice good, because there is videos on there as well. Steve: So you have ad revenue and you had all your eggs in that basket, so can you tell me about how you thought about doing Food Blogger Pro? Bjork: Sure, so that was three years ago now and it really came out of us – so we did these monthly business reports where we said, here is what’s happening, it’s pretty typical for what you see with like income report or transparency report or whatever you want to call them. Here is what we did this month to create an income, here are some of the expenses, here are some of the things that we learned. Steve: Was that the reason you had the income reports by the way or no? Bjork: It wasn’t intentional at the beginning and to be honest when I think back to when we first started, it was way in the beginning and it was before the blog was really anything, so we were making maybe $20 from it or $100 the next month. So I don’t think I would like to think that I was that intentional to begin with, but I don’t know, I don’t think I was. Bjork: It’s one of those things where you look back and it’s almost kind of funny really knowing what it was. I think there was truly, we started out by saying it was the food blog money making experience – experiment. So I think that’s really what it was and in a way I think what happened was I had like two people on my shoulder, so the classic like angle, devil situation, where on one shoulder was people saying like you can do anything, you can create one blog and have that be your full time thing. On the other shoulder are these articles that I had read where people were like of you’re going to do this especially in the food space you have to do it out of passion, only passion because it’s never possible to turn it into something like to make a business out of it. For me it was – and for Lindsay I think too was an experiment in saying like is this possible, is this something where we can build this into something that we’re actually able to create an income from. That’s like the purest form of what it started out as. I think as it got to the point where did start to get – some people that would follow along with them would be interested in them. It was at that point where we said, maybe there is a little sub category that we can build or sub community of people that are doing similar things, or interested in doing similar things and that’s where the idea of Food Blogger Pro came about. Steve: Is that course primarily marketed through Pinch of Yam? Bjork: Yeah and then we have some affiliates, we have some pretty awesome affiliates too and those are, I would say 99%. Everybody that I know of are people that are members of the course and then promote it to their readers. The nice thing is like the audience that we serve there is also people that have audiences, so affiliate marketing makes a lot of sense for us because we can just work with people that are members, and it’s natural for them to talk about it and promote it. That’s the really other big piece of it, but in general it’s something that’s tied to Pinch of Yam, like if we ever wanted to sell Food Blogger Pro, which we have no intention of doing especially not in the near future, nobody would be interested in it because they would be like, well it’s essentially attached to Pinch of Yam, it’s not necessarily a standalone thing. Steve: Got it, can I ask you like how you decided on pricing, it’s a membership site, then you have a yearly membership versus like a onetime fee, so I was just…? Bjork: That’s a good question, I think that I liked the idea – personally I really like doing small incremental changes over a long period of time, I’m more – especially at the time, not as much anymore. The idea of building something up and then doing a big launch was a little bit intimidating to me, and having like a high price point for it. I really liked the idea and still do of this recurring revenue as opposed to like a really big launch and then waiting. That being said, I think there is space for that and I think that it makes sense to have that type of offering in your sales funnel, or your offering list or catalog or whatever it is that you want to call it, and at some point we’ll probably start to have things like that. But it wasn’t like a super intentional thing to be honest; it wasn’t like I sat down and weighed the positives and negatives of having a higher price point. Steve: But you guys still do launches, right for this product, like right now it’s closed? Bjork: Yup, so that’s one of the things that we’ve changed and that’s why I was saying previously especially when I first got started, the idea of a launch was really a scary thing, but as we got into it, one of the things that we realized is like I was growing weary of like always promoting and always encouraging people to sign up. We worked with Stu McLaren who is connected with or was at the time Platform University and has done a lot of membership site and stuff. That was one of the recommendation that he had is both for marketing sake like it’s easier to market when there is an open and close and also so that you’re not always weary from promoting it. It makes sense to switch to kind of like a college or university, where you’re doing a longer period, people join and then they are part of the community. That was a big change for us and felt really good in the sense that we could step back a little bit and not always be in promotion mode. Gary Vaynerchuk talks about jump right hook, so you’re giving, you’re giving, you’re giving and then every once in a while you’re like; I’m going to promote this. That feels really good to have that rhythm, and also it’s just better for marketing, it’s something that I think people are used to, so there is big movie premiere and you see ads for it and everybody goes and they watch it. You have a long period like I said for college or university and it starts at this date, and everybody joins. There is a natural rhythm to it especially with something that’s community oriented I think versus I would say if it was a SaaS app or like an application. Obviously it doesn’t make sense to have an open and close for something like that, but that shift has worked really well for us. I don’t know if I would have been able to do that to start as much just because I wasn’t as comfortable. Steve: I mean it’s a ton of work which is why I don’t do open and close launches, instead I just have an email sequence that’s really long that teaches a lot, and then presents the offer and then teaches some more and then presents the offer. Bjork: What is your reason, is that something you tested or it just felt like a good fit for you? Steve: I don’t like doing launches just because it’s just too much work and pressure just all once and you have to do it – I would dread doing a launch every time I do it basically. Steve: And so for my personality I thought it was just better to just leave it open and let my email sell it for me. Steve: But I also do webinars too which is kind of like a launch but not really. I just do those once a month. Bjork: Okay once a month and is that only – this is like switching the interview a little bit, is that because, or is that only to new people to the list like who do you email for that webinar? Steve: Yeah people who have been to the webinars before, people who have expressed interest in certain pieces of content that I have, and people who are new to the list. Bjork: Got it, okay interesting. Steve: But what I found also is that people will attend multiple webinars, like there’s been people who have attended every single webinar that I have given even though it’s the same content sometimes. Steve: So Bjork real quick, in this interview I was hoping that you would be able to provide a piece of advice to somebody who wants to start a food blog, because we were both bloggers and I know that can be a slog especially in the beginning, right? Steve: What would you recommend for these people? Bjork: A few things here, I think it’s really important to figure out something that you’re going to you’re going to enjoy regardless, so there’s all types of income, so there is the income that we think about and that’s income where it’s like literally dollars into the bank account. But there is also these income sources that we don’t talk about as often it’s emotional income, like how do I feel when I’m working on this, am I excited, does it feel like a good fit, is this something I’m passionate about. There is relational income, so if you’re somebody who is naturally extroverted and you’re wanting to be around other people all the time, maybe starting a blog where you’re like having to be by yourself all the time and work on content in this closed room isn’t going to be a great fit. If you do know that you want to do a blog and you are super extroverted, think about ways that you can shift that so that you’re working with individuals more or working with other people, if relational income is a really important thing for you, that you’re factoring that in. So that specific item is think about the types of income not just like the primary money income which is what we normally think about, there is all these other ways that you could be creating an income. I think the other thing especially if you’re going to be going in to something purely content driven where you are eventually going to want to work with advertisers or sponsors or things like that, to know that it takes a really long time, and that’s why that first tip or takeaway is so important. It just takes a lot of time to get up to speed if or get to the point where you’re creating enough monetary income for that to replace your job or to be significant enough that it makes an impact, so to be patient. We call that 1% infinity, this idea that you’re improving a little bit 1% over a long period of time infinity, but doing that each and every day, that’s a really important thing. Specific to the food space, I would say it’s really important to think about what is it that you’re going to own in terms of the niche which we talked a little bit about before, and you’re able to get a lot more traction if you start out with a specific niche. The interesting thing here is that there has to be a balance between claiming a niche, but also restricting yourself long term to only that niche. I think that would lean into the name side of things, so I think you can have a name that is flexible enough, that allows you maybe to claim that name and then have maybe a tag line that defines the niche a little bit more. So down the line you’re able to open it up a little bit once you do have that traction initially that you’ve gained because you’ve claimed this niche, because that’s such a common thing is eventually you get to a point where you want to niche out. Amazon didn’t want to sell books forever, Zappos didn’t want to sell shoes forever, their names allowed them to change because of the flexibility of that. If it was a shoesite.com, it would have been really hard for Zappos to switch down the line. I would say the third piece is think about a niche that you can start and that you can really claim, but always be thinking about the reality that later on you might want to open that up a little bit and to be intentional on how you’re structuring it and naming it and branding it to allow that to happen. Steve: I think dashofyam.com is available too? Bjork: Oh yeah, there you go, yeah. 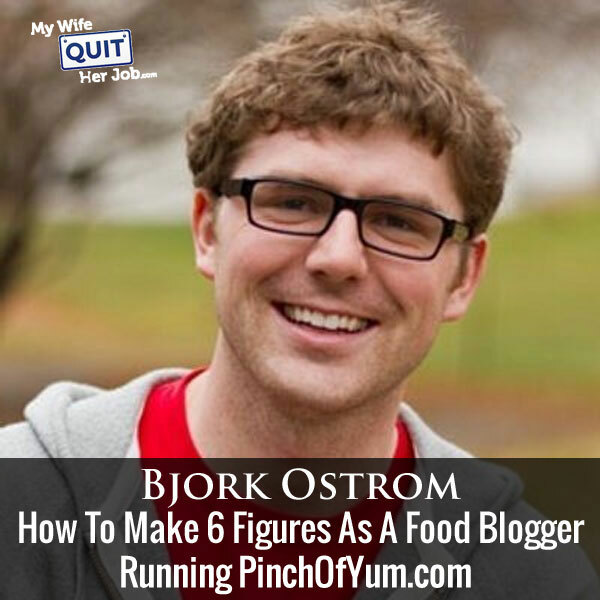 Bjork: If people wanted to reach out, probably the best way, I’m not super active on Twitter, but if people wanted to reach out and connect with me on Twitter I’m on there, Bjorkostrom, and then we’re just at Pinch of Yam and Food Blogger Pro. So if you want to follow along with what we’re doing, you can go to Pinchofyam.com, and then the membership site is foodbloggerpro.com, and we’d love to connect and hear from you, so that’s it. Steve: Cool, thanks for coming on the show Bjork, really appreciate it. Bjork: Thanks so much Steve, appreciate it. Hope you enjoyed that episode. As I mentioned before Bjork is one of the most successful food bloggers I know, and is the perfect example of someone who took an interest and turned it into a thriving business. For more information about this episode, go to mywifequitherjob.com/episode143. And just a reminder that tickets for the 2017 Sellers Summit are now on sale at sellersummit.com, the conference that I hold every year that specifically targets ecommerce entrepreneurs selling physical products online. The event will be small and intimate, and I promise you that the speakers will focus on actionable strategies to improve your ecommerce business and not any high level BS. So head on over to sellersummit.com, and check it out now.